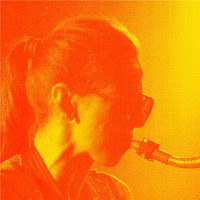 If various internet sources are accurate, Virginia Genta has been playing music since she was a young child, always self-taught and in the vein of free improvisation. I heard her play not long after her most consistent group, Jooklo Duo, started releasing music in 2007 (to the best of my knowledge, it’s a little murky). Her playing, predominantly on tenor saxophone (though she plays almost all variations of the instrument and is as likely to sound like Peter Brotzmann as she is Yusef Lateef), has always bent towards free improv, cosmic exploration, and passion. Over these ten years or so, she has also picked up a lot of technique, lyricism, and overall virtuosity. So then, it comes at a perfect time for Holidays to release her first (not including a self-released lathe 7”) release of solo sax recordings. It’s brief, only a two sided single, but fits nicely into the great tradition of the solo jazz/improv record. In my estimation, the solo recording has always been about making a statement, stripped down from the trappings of structure, interplay, etc. It’s a chance to put the artist’s voice on full, idiosyncratic display, typically by soloists who are more used to leading groups, but also in the artists who worked mostly in this medium (such as the incomparable Kaoru Abe). So on this short recording, Genta makes sure to state her voice early and quickly. This is no calm introduction, but a blast of dense, high-pitch noise coming deep from the gullet, peppering the listener’s ear drums with pointillist, staccato notes that are hardly discernible. If you had never been introduced to VG before, this is not the restrained, beginner’s version. If you’re going to dive headfirst into this, you had better like your saxophone squelching, rumbling, stabbing, noisy, piercing, burning…anything but what you might expect. And as much as the saxophone itself is being pushed to the limits, I felt my own ears were at times, too, especially because of the high register that dominates both pieces. There is also time for more thoughtful, drawn out playing, and the bursts of silence really highlight the incredible intensity that precedes them. Typically, the phrases last as long as she can keep her breath going. Genta has played in so many different set ups on so many albums that you could just as easily find drone, psychedelic rock, noise, and folk in her oeuvre as you can jazz and free improv. These pieces are a nice encapsulation of this, though more in the urgent, intense mood than anything else, they touch on the fire of New York loft jazz, the absence of structure found in European free improv, and the experimental technique of the ‘post-jazz’ improvisational melting pot. This is a fine recording, and the length is set very well for the level of power, which probably could exhaust you if it was a full LP, or at least make your cats go crazy. As Genta continues to explore different musical realms while defining her individualistic style, this record will stand as a fiery summary of her unpredictable and idiosyncratic style circa 2016, while also highlighting the technique and vision she’s built over decades. Very good review - I have the 7" and your words quite match my own expirience and thoughts. Though one sentence is somewhat askew: "...the absence of structure found...". That's a notion which always makes me wonder if this is only a lazy form of description or if it is meant as a genuine illustration. Isn't it obvious that in human affairs there's no such thing as "absence of structure". At one level, you're probably right, but expressions like "absence of structure" are relative and must be read in context.